If you do a science project on how the mass of a paper airplane affects the speed, it will be the one time you’re allowed to fly paper airplanes in class. Make the most of the opportunity by changing several variables of plane design involving mass to produce the best paper airplane design. If you look at a large plane and think about its mass, it doesn’t appear capable of flight. By experimenting with how mass affects the speed of your paper plane, you will better understand real airplane design. The weight of the paper affects the mass of the paper plane. Very heavy paper, such as poster board, is too heavy and hard to fold. Very light paper, such as tracing paper, is too frail. One of the ways paper is classified is by weight in pounds, with higher numbers indicating thicker, heavier paper. Experiment with different weights of paper using the same plane design to find the optimal weight. Test the speed of the planes by measuring the distance they fly and how long it took. 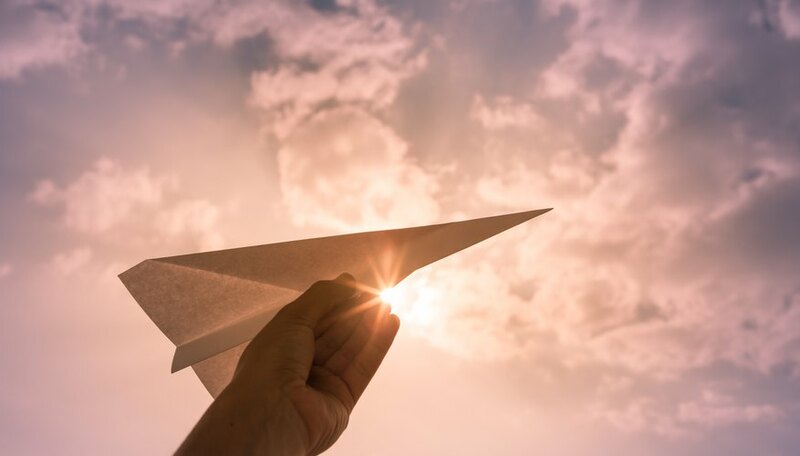 In the same way a rock that is thrown pushes its way through the air as compared to a cotton ball, a paper airplane with more mass flies faster and farther than a paper plane with less mass, up to a point. If the mass is too great, the wings can’t hold the plane in the air. When you have a good paper airplane design, try adding pennies or other small objects to the front to add more mass. Tweak the amount of added weight for each trial flight. Measure the distance and the time it took for each try to determine the ideal mass for the fastest speed of your design. The center of mass, or center of gravity, is a point where the paper plane is balanced. You can find this point by balancing the plane on your index finger. The mass on both sides of your finger is the same. The location where the stability of the paper plane is neutral is called the neutral point. The plane will be unstable, fly slower and crash with a center of mass behind the neutral point. A center of mass forward of the neutral point provides more stability. As plane stability increases, it flies progressively faster. Experiment with slightly different positions of a paper clip on the plane’s nose. A paper airplane with a larger mass in the body and smaller wings will fly faster than one with a smaller body mass and larger wings because its “wing load” is larger. To determine wing load, divide the weight (mass) of the plane by the surface area of the main wing. Compare designs of paper planes with larger wing loads and lower wing loads. Measure the distance and the time it took for the plane to go that distance to compare the speeds of the planes. Strauch, Annette. "Science Project on How the Mass of a Paper Airplane Affects the Speed That the Plane Will Fly." Sciencing, https://sciencing.com/science-project-mass-paper-airplane-affects-speed-plane-fly-12040679.html. 30 April 2018.